A few weeks ago I wrote a post on how to get Generation Y involved with classical music. This week I made a list of fun things you can do with the youthful Generation Z. Check out your local library or church to see what free, kid-friendly community events they have on the calendar. Libraries are filled with educational outlets that encourage kids to be actively involved with their community. One of my favorite library events is storytelling with live music. Even as an adult, I love these because you learn so much from the musician’s perspective, but you also become even more enamored with the characters in the story. Many local churches also provide concerts for the public with a donation at the door. Some churches even hire professional musicians to collaborate in both secular and non-secular music. This is a great alternative to spending money at an unfriendly, upscale venue. If you’re living on the east coast, then you’re probably sick of the snow, so let’s talk about warmer weather! 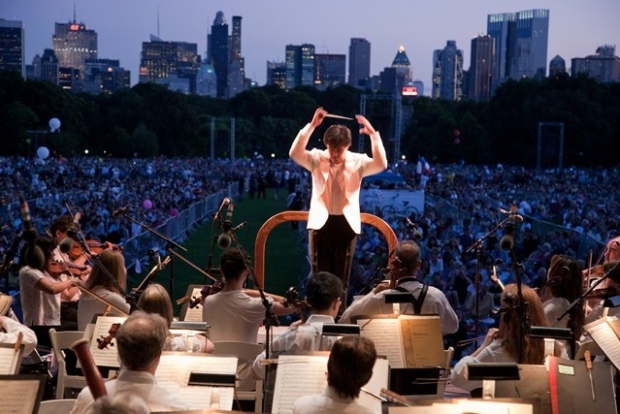 During the summertime, many orchestras and local ensembles give free “Concerts in the Park.” Every summer, the New York Philharmonic travels the five boroughs giving free lawn performances that are open for the public to come and join. This is a great, cost-friendly opportunity to spend some family time together. Grab a blanket or two and have your own picnic with your loved ones while surrounding yourself with nature and music. Do you enjoy live professional performances, but are unable to travel all the way to New York City or Los Angeles for the real deal? Try taking your kids to the movie theater! (That’s right, the same place you just took your kids to see “Frozen!”) Fathom Events creates a unique entertainment experience in the comfort of your own local movie theater. The Metropolitan Opera has their “Live in HD” program series where selected operas are recorded and streamed live to your local theater that hosts Fathom Events. The same goes for ballet companies like The Royal Ballet Cinema and top name orchestras like the LA Philharmonic. There’s no need to travel, tickets are cheaper, and the view is even better. Museums, like libraries, are nourishing for young minds when it comes to educational experiences. Before buying tickets or visiting, check out their calendar and see what other events are happening on the day you plan to go. With admission to the museum, concerts on the grounds are fun for everyone when you need a little break from walking. If your little ones get rowdy and can’t sit still any longer, simply go back to exploring. Sometimes musicians will demonstrate instruments that would be on display at the museum, or the music they are playing will somehow be associated with an exhibit they are highlighting in the program. Did you know the composer who wrote the music for “Swan Lake,” “The Nutcracker,” and “Sleeping Beauty” is the same composer who wrote the famous bombastic “1812 Overture”? If you’ve been watching the 2014 Winter Olympics, Sochi honored many of their most famous Russian composers such as Tchaikovsky. Borodin’s Polovtsian ballet dances from his opera “Price Igor” was also featured during the Sochi Opening Ceremony. Music has always been a medium for ballet and vice versa. Taking young kids to listen to Stravinsky’s Firebird Suite can be painful on their ears, but when it is performed with beautiful fiery red costumed dancers on stage striking erratic movements, then it catches their attention. Studies show that children under the age of 8 are more visually inclined when it comes to learning something new. Ballet can be a great introductory experience to the world of classical music.